Puppies and adult dogs frequently will chew on and swallow articles of clothing that are left lying about. This can result in mild to serious health concerns. This is a guide about my puppy ate a sock. My puppy keeps eating socks! What do I do to get her to stop? They have bitter apple spray you can buy at any pet store. Heavily spray on an old sock with it. The taste should turn the puppy off to the sock. Or, take away the sock, say, "No!" and then give your puppy a rope toy while saying "Good boy/girl. If your puppy continues to eat socks he/she can die of an obstruct. If the behavior is not corrected now you will have a dog that continues the same behavior. Your best bet is to make sure when the puppy is out you are watching him/her and that the floor is clean of everything but puppy safe toys. I highly recommend Kongs or nylabones. Good luck! Not meaning to sound sarcastic in the least, but all you can do is keep the socks out of reach. Dogs are naturally attracted to all the scents we humans think nasty in dirty socks (and shoes) and once a pup begins a sock or shoe fetish I've yet to find a solution short of putting all the shoes and socks safely away. They eventually even go after the clean ones, too. Hoping to find similar odors, I presume? 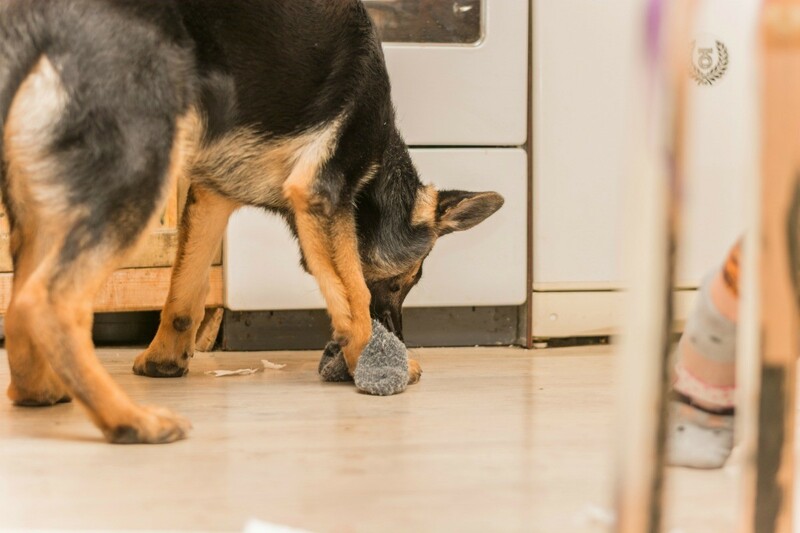 Since I do have experience in this area, (thanks to my oldest dog) an important question to ask: Is the dog pooping the socks or are they still in her system? If you haven't found them in poop piles, you need to contact your vet, ASAP. This kind of obstruction could indeed cause the painful death of your dog. I know a lot of people swear by the bitter apple spray, but it never worked for our dogs in any circumstance. Again, the only solution that worked to cure our sock eater was to keep the dirty socks in hampers with lids (in closets with closed doors) and the clean ones safely tucked in drawers. Again, please contact your vet if your dog has not eliminated the socks she consumed. Good luck. Please keep everything except your animals own food out of their reach. If not be prepared to write your veterinarian a huge check. I am watching a Golden puppy who ate a sock at 5pm. She pooped at 5:30 and at 8 but no sock. Please help. What should we watch out for? She seems fine. She is napping as we speak. My 3 year old Lucy dog seems to have a "toilet paper deficiency" in her diet, too! If I lay down to take a nap and she is in my bedroom, she gets bored (I guess) and pulls every piece of TP or Kleenex out of the trash can and shreds it on the bathroom floor. She's never eaten a sock (or any TP as far as I know) though. Please be careful with this little guy...and let us know how he is, ok? Yesterday I happened on this site cause I goggled my dog swallowed a sock. Yesterday morning my dog threw up a black ankle sock. I read some of the blogs and felt my dog was still not up to par maybe he still has something in his tummy. So when I got home from work I tried the peroxide 1 tsp and about 4 oz. of milk. Guess what within 30 sec. My dog thew up 3 socks. Oh my goodness. He felt much better right away. This morning he was back to his old self. Thanks so much for the advice. Wow, poor puppy. Hopefully it came out!? My puppy is 9 weeks and my house is puppy proofed. However, when I go outside in the yard to let my puppy 'do it's business', he will eat grass and dirt like crazy! I thought my yard was puppy proof, but apparently he found a big piece of black tape and ate it. Welcome to the club. The vet said it was not a problem as long as you accounted for the socks eventually. Allie, our German Short hair, is 8 + years old. Socks were her thing. The baby and child socks. That was her thing. Down the hatch. Yes, they poop them out. You watch for about 2 days of pooping, they will show up. If you have doubts, give your dog some cooked squash or pumpkin. Acts as a laxative. Capturing the dog when she is stealing socks makes it worse, it becomes a game. Too many orphan socks, so started buying the same ones. She will steal Kleenex or even paper towels from the garbage. Loves the human contact on things. I hated it when she stole the baby's diapers. So they would go out to the trash right away. Would also find her rummaging through the laundry to find someone's socks, especially if it were 'her master'. When the middle son would visit (he brought her home originally, I set the rules, I became the master), we have behaviors cause she misses him. The comments on making the dog throw up. Get advice before doing that. Could be a problem. Peroxide is the thing the vet said to use. Again, Allie antics - ate the whole pan of chocolate brownies. Yes, toxic. So 2 oz. at a time down her throat. The vet is at the end of the block and came over when Allie did not chuck the first 2 ounces. She administered and then waited for results. About 3-4 minutes and it was up.